NARA M653. Eighth Census of the United States, 1860 population schedules. Browse the 1860 US census by state, county, and civil division. 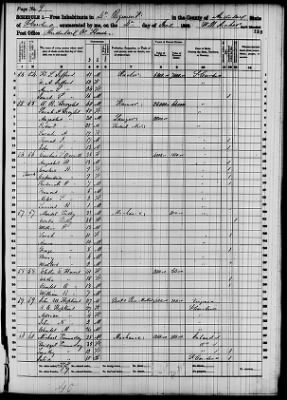 This particular census is especially helpful in researching the Civil War era and the soldiers who fought in the imminent conflict. Information about each member of a household as of June 1, 1860, includes age, race, occupation, real and personal estate values, birth place, if married within the year, and if a person was deaf, dumb, blind, insane, idiotic, pauper, or convict. Relationships are not detailed until the 1880 census.